A big Stuck At the Airport thank-you to the Hilton Los Angeles Airport hotel, which hosted me for a night recently while I was in town to tour Los Angeles International Airport for a story about the best places to eat in each terminal and a visit to the brand new United Airlines Polaris lounge. I hadn’t stayed at this property for quite some time and was pleased to find upgraded rooms, strong WiFi and live music in the lobby, which is evidently a regular Wednesday evening feaute. This hotel has a variety of dining options, but I tried out Andiamo, the onsite northern Italian restaurant, where the staff made a solo diner feel welcome and which has a great scallop dish on the menu. This hotel may also have the hardest-working shuttle bus driver. He was driving when I arrived in the evening and there again the next morning and he was super-pleasant to every single rider, even though few of them gave him a tip for lifting their super heavy suitcases on and off of the bus. Have a favorite place to stay near Los Angeles International Airport? Please share your recommendations. The Tom Bradley International Termional at Los Angeles International Airport is pretty swank and awfully big. But it’s not big enough. So LAX is buildling a bonus Midfield Satellite Concourse (MSC) with 12 extra gates just west of the terminal. Scheduled to open in early 2020, the new terminal – or MSC – will be connected to the Tom Bradley International Terminal by both a 1,000-foot passenger tunnel with moving walkway and a bus port to allow transportation on the airfield from other terminals. Here’s a short video LAX shared. 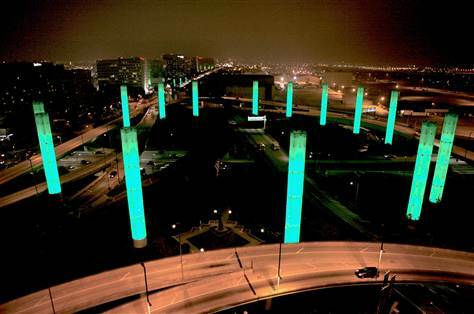 To mark the day, airport police officers at Los Angeles International Airport (LAX) will hold a “Dr. Seuss Hour” from 10 to 11 a.m. as part of Read Across America Day. During that hour, officers will read books to kids and adults and the Cat in the Hat will pose for photos with travelers. The LAX PUPs (Pets Unstressing Passengers) and their handlers will be on hand as well. Kids who attend the Dr. Seuss Hour will get souvenir travel bags with copies of Dr. Seuss’s book, LAX activity coloring books, and “Cat in the Hat Read Every Day” bookmarks.